De Kuip in Rotterdam hosted the final. 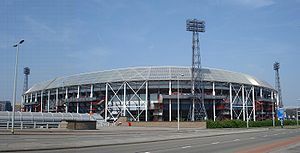 The 2001–02 UEFA Cup was won by Feyenoord at their home ground in the final against Borussia Dortmund. It was the second time they won the competition. A total of 145 teams from 51 UEFA associations participated in the 2001–02 UEFA Cup. Associations are allocated places according to their 2000 UEFA league coefficient. Associations 22–49 each enter two teams, with the exception of Liechtenstein who enter one. Marítimo won 2–0 on aggregate. 1 Only one leg was played, in a neutral venue in Warsaw, Poland, due to security concerns in Russia. 2 PSG won 3–0 because there was a blackout in Bucharest at that time and the match was stopped immediately in favour of the visitors. Wacker Innsbruck won 1–0 on aggregate. 3–3 on aggregate. Maccabi Tel Aviv won on away goals. Osijek won 3–1 on aggregate. Freiburg won 2–1 on aggregate. Valencia won 6–0 on aggregate. 3–3 on aggregate. Helsingborg won on away goals. Sporting CP won 6–2 on aggregate. CSCA Kyiv won 3–2 on aggregate. Internazionale won 6–0 on aggregate. Chelsea won 5–0 on aggregate. Milan won 6–0 on aggregate. Wisła Kraków won 3–2 on aggregate. AEK Athens won 4–3 on aggregate. 3–3 on aggregate. Varteks won on away goals. Rangers won 1–0 on aggregate after only one game was played. Rapid Wien won 5–2 on aggregate. Ipswich Town won 3–2 on aggregate. Viking won 3–1 on aggregate. Roda JC won 5–3 on aggregate. Valencia won 7–2 on aggregate. Freiburg won 4–2 on aggregate. Ipswich Town won 3–1 on aggregate. Litex Lovech won 2–0 on aggregate. Copenhagen won 1–0 on aggregate. PAOK won 8–3 on aggregate. Rangers won 7–2 on aggregate. Sporting CP won 7–2 on aggregate. Servette won 1–0 on aggregate. Leeds United won 6–5 on aggregate. Club Brugge won 7–0 on aggregate. Parma won 3–1 on aggregate. AEK Athens won 5–3 on aggregate. Hertha BSC won 3–0 on aggregate. Grasshoppers won 6–4 on aggregate. Brøndby won 6–3 on aggregate. Hapoel Tel Aviv won 3–1 on aggregate. Slovan Liberec won 4–3 on aggregate. PSV Eindhoven won 6–4 on aggregate. Lille won 3–0 on aggregate. 1–1 on aggregate. Valencia won 5–4 on penalties. Servette won 3–0 on aggregate.